DeChanta’s job isn’t easy. 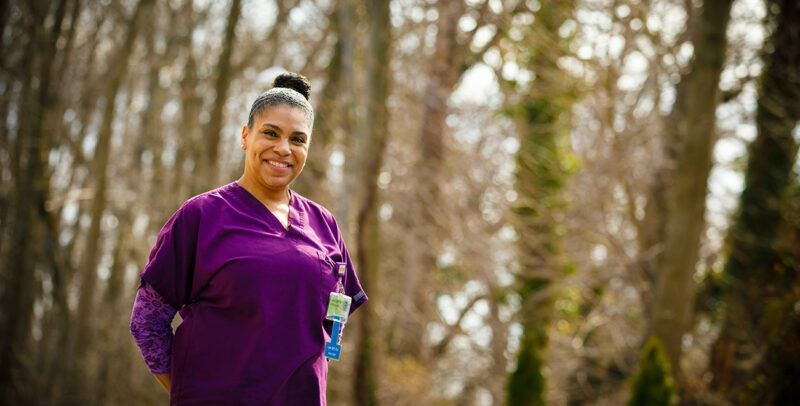 Every day, she needs to ensure that each employee under her supervision is dedicated to the service and quality standards set by Cadia Healthcare, a long-term care facility in Wilmington, Delaware. Because there are a lot of emotions around the clientele they serve, she says her staff needs to provide exemplary service to meet and exceed residents’ and their family members’ expectations. DeChanta and Cadia have partnered with Generation since its inception in 2014, helping to form and shape the program to what it is today. Currently, 34 students from the Generation program are employed with Cadia, and the need is clear—90 percent of Generation CNA graduates found work within a year. The Bureau of Labor Statics reported in 2017 that there were more than 1.5 million Certified Nurse Assistants (CNAs) employed in the U.S. and 41 percent of these individuals were employed in nursing homes. A certified nursing assistant job at Cadia is full of challenges. It’s very demanding and the hours, more often than not, aren’t 9-to-5. And that’s why DeChanta says it’s more important than ever for her to find new employees with tenacity in entry-level roles. She says that developing individuals’ careers in partnership with Generation gives her a jump start on finding those determined, steadfast, and excited new staff members and that the trust she now has in Generation, helps her with the hiring process. Like a lot of companies, it’s hard for Cadia to find entry-level employees that are reliable and trustworthy. Generation works on the hard and soft skills employees need to be just that. In fact, 88 percent of our CNA graduates are retained 90 days after they’re hired, compared to a 2012 American Health Care Association (AHCA) study, that reported that median CNA retention rate in skilled nursing facilities in was just 68.3 percent. Our curriculum focuses on communicating with supervisors, being on time, and building on the behavioral skills and mindsets you can’t see on a resume. And DeChanta thinks that makes all the difference. DeChanta says that Generation helps her find employees that exemplify these soft skills and more importantly, Generation is willing to tweak programs along the way to fit the needs of the employer. Partners like Cadia and Generation think that if you can change the direction of just one person’s life, you’re doing right. Generation serves a population of young people for whom the existing education-to-employment system has not worked. They face a myriad of life challenges, including those as basic as transportation and child care. To allow Generation students to manage their lives during training and focus on learning, we provide social and instructional support services. Generation’s program is aimed at young people who have barriers such as being diagnosed with a disability, having a GED but a lack of work history, are a single parent, and/or are people who are living in low-income households, and we train them for new jobs in fields where employers can’t find people to fill their positions. And Generation works with 1,900-plus employer partners and a wide range of implementation partners and funders to train those individuals to help close the skills gap. Partners like Cadia know that Generation makes an investment in many different areas of an individual’s development, including providing mentorship in tandem with instruction. Professional mentors assist with everything from mock interviews, coordinating child care services, to transportation issues during the program. As an added benefit to the employer, the professional mentoring continues up to 24 months as graduates adjust to their new jobs. With Generation’s proven and tested curriculum, businesses and employers undoubtedly benefit. Our retention and recruitment efforts create lasting career impacts—so both participants and employers have the incentive to continually invest in skills-training opportunities.